Isn't it funny how much can happen in a year? A year, in the grand scheme of things, is a hiccup in the fabric of time. It's there and then it's gone. Just like that. But when you stop and think about the preceding 365 days...the red carpet of mornings and nights that have lead you to this very spot in time, it's kind of...rockin'. Just one year ago today I embarked on a new journey; a simple race, but a race that would forever change me and the way I saw things. Corny? Absolutely! But, true. 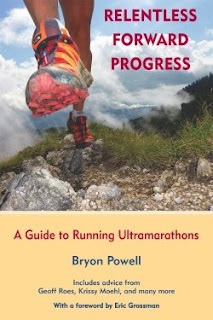 The 2008 Stone Steps 50k was my very first ultra, and I'm very happy to have a solid year of ultrarunning under my belt, which includes three 50ks, one 60k, two 50-milers and a one-hundred miler (um, what? I forget that I did that from time to time; I never planned on running 100 miles!! )...and one more 50-miler coming up this weekend...holy smokes, where did all that come from?! A lot can happen in a year, and even all that running was just the tip of the iceberg. I know I'm still a novice at all this ultra stuff, but getting through some of the races I got through sure makes me feel pretty good about my place in the ultra world, and I guess in the world in general. It's fun to look back at those runs, knowing what I know now, and knowing that I still have a LOT left to learn. I don't think you can ever know everything you need to know about ultrarunning; it is a perpetual learning experience that I look forward to every time I toe the line. What's more, is that being able to share this passion and excitement with someone who 'gets it' every single day eclipses that feeling you get when you cross the finish line. Geof is that someone :) He's a pretty great dude, not gonna lie. Just some thoughts for a Monday afternoon! Gotta love that! Best thing about writing a blog is being able to go back and read the past. Still looking forward to my first 50 miler, sometime down the road. Have a great time at North Face! LOVE this--such a beautiful post! Somehow I had no idea you'd only been at this ultra thing for a year! ONE YEAR! Look at the ridiculously amazing things you have accomplished in just 365 days! I figured you must have been at it for years! You are such an inspiration. Someday I will get brave enough to try my first ultra, I promise :) And when I do, I will have you to thank, girl. You are such a rad ambassador for the sport (yes, I just said "rad"). Kick it, this weekend! 50 more miles? Check!! "And you PAY to do this?" Glacial Trail 50k: Double Shwag!